Handbooks published by Max Parrish. Published under the auspices of the Ling Physical Education Association and the Royal Academy of Dancing. 26 volumes. 4 to 6 dances per volume. Each of these conveniently-sized volumes contains a historical and general essay, four colour plates of costumes, descriptions of four dances, a list of places and dates where dances can be seen, and a short bibliography. The production and printing  especially of the colour plates and the music  are highly commendable. It must often happen that a folk-dance enthusiast, specializing perhaps on the dances of one or two regions, needs some small books on the dances of other countries for completeness' sake. The lowish price of the individual volumes of a series such as the one under review makes it ideal for this purpose. On the other hand, for use as a work of reference the series is decidedly uneconomical. A little calculation shows that 104 dances and costumes cost plenty; and a comprehensive book on European folk-dances together with another on costume would provide more for less. There is one point in particular about which the prospective user of the series will need to be warned. In each volume (except that for England and Wales) is a page recommending certain reference books. For descriptions of foot-positions and explanations of any ballet terms: three ballet primers are named; and, for descriptions of figures, the Royal Scottish Country Dance Society's publications, the English Folk Dance and Song Society's publications, and The Country Dance Book parts I-VI (Novello). Now the numbered foot-positions are scarcely used in the series  in fact, only in the Scottish and Spanish volumes. And the foot-positions actually used in these dances are not the positions of the ballet (in which the feet are fully turned out) but the partially-turned-out positions used in pre-ballet training or Old-Time dancing. This reference to the ballet primers is likely to be misleading. Other ballet terms are not much used, and where they are they are usually explained. In point of fact they are not very skillfully used. To take one example (from Dances of Spain II, p. 38 1,17), the instructions read "Whip r. foot in a circling action (Rond-de-jambe). Now the instructions are ambiguous: does the foot circle clockwise or anti-clockwise? The ambiguity would have been resolved had the full ballet-term (rond-de-jambe en dehors or rond-de-jambe en dedans) been used, but it was not. Furthermore, one suspects that a rond-de-jambe en l'air is what is wanted. There are other instances (especially in the Spanish volumes) where ballet-terms add nothing to the descriptions, and there seem to be none where they make the instructions clearer. As for the figures, there are no books published by the Royal Scottish Country Dance Society (R.S.C.D.S.) which give descriptions, though there are three published outside the society. (A Complete Guide to Scottish Country Dancing, Anderson and Duthie, MacDougall; Won't You Join the Dance, J.C. Milligan, Patersons; Scottish Country Dance, Newman Saunders, Pitmans.) Nor will the reader find what he wants in books published by the English Folk Dance and Song Society (E.F.D.&S.S.). The reference to The Country Dance Book is nearer the mark, but it is pointless to recommend all six parts. These volumes are primarily descriptions of dances, but each (except for part V) contains a substantial section explaining steps, figures, etc. However, this section in parts III, IV, and VI merely duplicates that of part II, and there is no point in consulting more than this one part (or perhaps part I also). But the reader who ignores these references will come to little harm, for the figures are adequately described in the English, Irish, and Scottish volumes, and the British figures are of little relevance to dances from the mainland. Some dances have their own proper tunes; some can be danced to any one of a certain group of tunes. Among folk and country dances the former are the rule and the latter the exception, but the exceptions are quite numerous: for example, the dances in the Ireland volume have arbitrarily-chosen jigs and reels printed with them, the Highland fling goes to any Strathspey tune, the English Circassian Circle to almost any British duple-rhythm traditional dance-tune, and so on. The student of dancing needs to know whether the tune printed is a tune or the tune for the dance, but he is in this series never told. Again, a distinction  an interesting and important distinction  can be drawn between those dances which consist of a fixed sequence of fixed movements (the majority) and those which are an arbitrary sequence of suitable movements  dances like the Highland fling (which is an arbitrary sequence of fling steps), Seann Triubhas, the Krakowiak, the Mazurka, some Schuhplattlers, some Kolo, Some Background, the Jota Aragonesa, and so on. Occasionally this is pointed out, but all too often it is not. Further, the costumes illustrated are not all on the same plane. There are first the proper dance-costumes: those of the Italian sword-dancers, the English sword and Morris dancers, and the Andalusian dancers, for instance. Secondly, we have costumes which though not specifically dance-costumes are in fact the correct costume for the dances: the kilt for the Highland dances, and many, many regional costumes for the appropriate local dances. But here we already need to be careful. It is all very well to dance a Krakowiak in the costume of the Krakow region, but the Krakow region boasts many costumes. 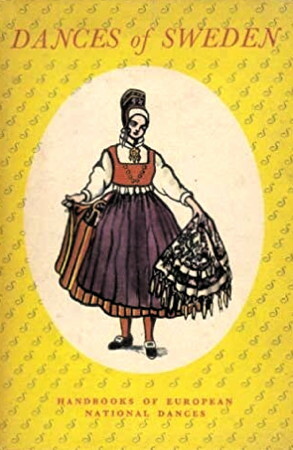 If one compares the costume illustrated in Dances of Poland with that in another book  Irena Lukaszewicz's Polski tance ludowe, for example  one finds that they are quite different. This does not mean that either book is wrong: it means that the costume described in Dances of Poland should be described as a costume suitable for the dance, not as the costume for the dance. This remark applies over and over again. The third category consists of costumes which are vaguely felt to be suitable because they are ancient or traditional or "folk" and were in use at about the same time and place as the dances, without any good reason to suppose that they were actually used for dancing. These include the "Maypole" costumes in the English volume (the smock is surely a working dress, not a dancing dress), the Welsh costumes, and the eighteenth-century Irish costumes. Fourthly there are a few costumes which are definitely not dancing costumes  the cloaks in the Irish volume and the Newhaven fisherwives' costume. Interesting as these are, and appropriate as they would be in a book of European costumes, they are out of place in a dance book. Reading a cookery-book until you know it by heart will not make you a cook  any more than you can learn how to remove an appendix without going into the theatre and watching the whole procedure. The four charming little books on the dancing of Greece, Romania, Bulgaria, and Yugoslavia set themselves an impossible task. They try to initiate the reader (ostensibly a reader who has never seen these dances) into an art and craft that can be learned only by personal and direct experience. The illustrations are good and reasonably accurate except in the Bulgarian book, which features highly dramatized  almost balletized  pictures of folk-costume. The musical arrangements that illustrate the various dances in the four books are contrived with great taste, but they give not the remotest idea of how the tunes sound when played by folk musicians. For instance, the Hora arrangement on page 26 in the Rpmanian book is so pianistic that it requires a first-class musician to perform it. The sad fact remains that no matter how painstaking, how apparently clear, an author's instructions, it is virtually impossible to give anything but the haziest idea of the actual physical movements involved in a dance-step  particularly a Balkan dance-step that may easily be in a 5/4, 7/8, or 11/16 dance rhythm. We are back to the basic and undeniable fact that folk-arts cannot be learned or taught from books: they must be absorbed by direct personal contact and experience. We cannot ever learn the folk-dances of other nations as we learn classical ballet steps.